First of all, just to be up front, I did not find or rediscover this tree. I was invited to join the people who had done the detective work to locate this particular tree. It was quite a story of internet research, social connections with people who could access research papers, and at the end of the trail, an incident that is nothing short of a stroke of luck. All that work plus two previous trips searching the mountain resulted in us locating the tree after just over an hour of hiking. Easy, if you know where it is. VERY difficult if you do not. 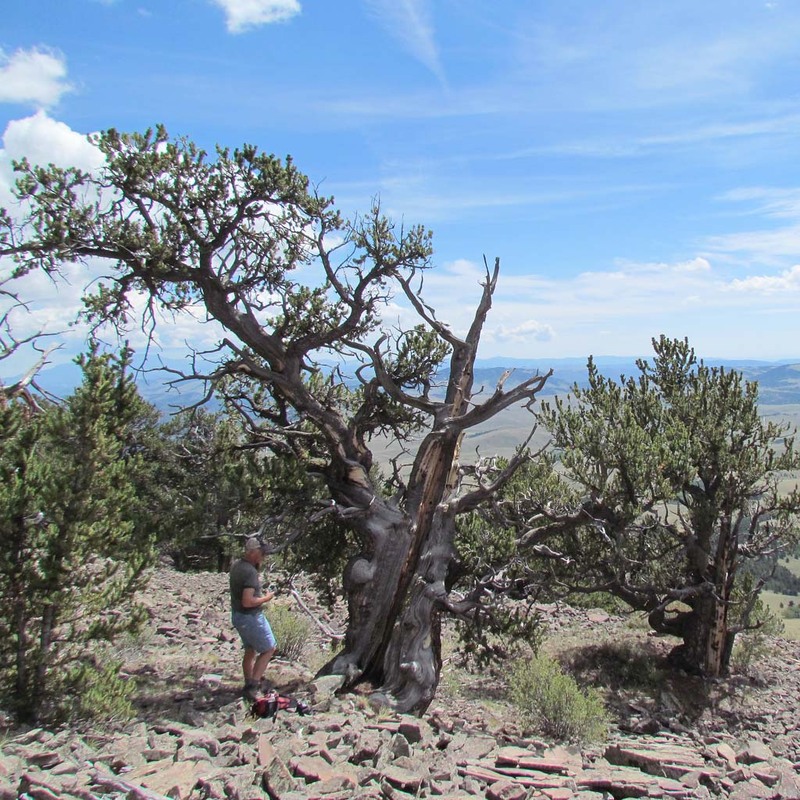 The trees are located on national forest land, but the Forest Service's policy is not to reveal anything about the locations. If you ask, they won't know anything about them. Their reason is simple - they want to protect those trees. And with good reason. We had to be very careful around them. They are located on steep slopes and usually surrounded by talus, which is unstable to walk and easy to dislodge some rocks. In addition, the trees themselves, although having large generally solid trunks, are breakable if one slips and grabs a limb. The trunk and most of the limbs are dead. 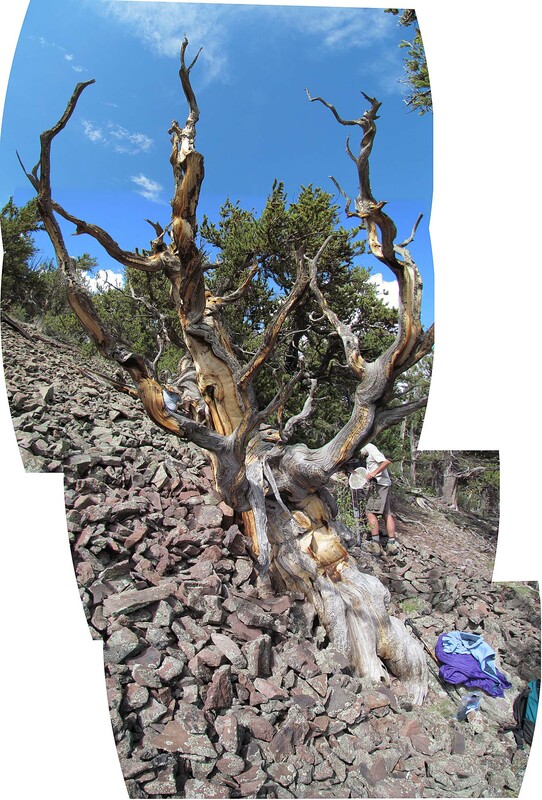 The oldest usually have only one living limb, and if it is damaged, it will soon no longer be one of the oldest living trees. So, you will not learn the location of these trees from me. You can find the general location of them with a diligent internet search. But unless someone shows you where they are, it is very time consuming to search an entire mountain side for a few tagged trees. And if I did not show you what it looked like, you would not know which one of them was the oldest. The first impression is that the tree is dead. What part of it could still be living?! Just one branch (albeit a substantial one) on the uphill side. It is hard to see because the branch grows into the branches of the tree next to it. The next impression is that it is colorful - not at all the gray one expects of old, nearly dead trees. 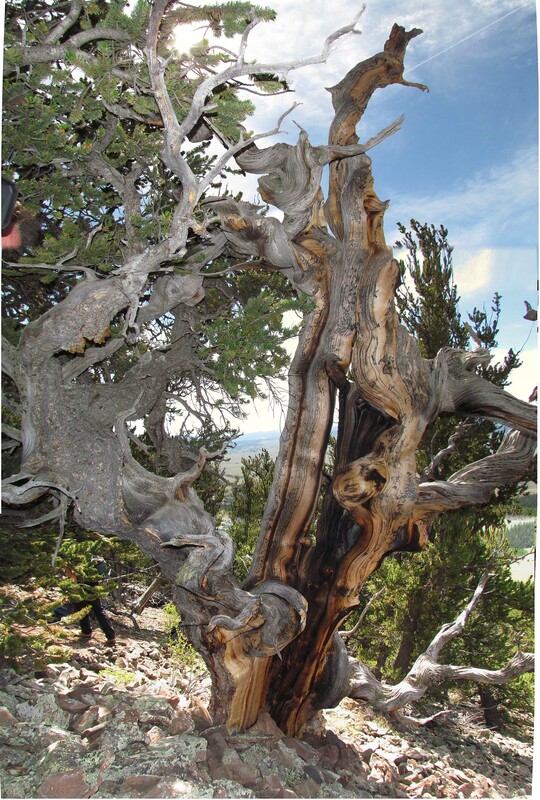 On closer approach, I was fascinated by the wind-blasted twisted sculpting of the branches where the bark no longer was. It looks like the tree grew that way, but that seems improbable. I was told it was done by the winter wind carrying ice particles. I spent at least a half hour at a distance from the tree at first before going up to touch it. I wanted to let the people who had located it have the first contact with it, as it were. And I also wanted to take it in and let the reality of this living object that was 2500 years old sink in. It was pretty special to be a part of this event, and I did not want to treat it as just another experience to collect and move on to the next. This was not a tourist attraction. This was like a silent sentinel with its back turned to time. It has impassively lived thru centuries - centuries filled with events going on in the hills below and far beyond this mountain side. It was sort of like a time machine. If I could only run my finger over a cross section of its rings and touch one, any one, maybe I could relive what went on that year of its life. This was a pretty unique object! Because we knew about where it was, we hiked almost to it. We found it about two hundred feet above where we expected it to be - just about straight above us. We knew it was along the edge of a field of talus, but that field of talus was steep, sometimes a near 45 degree slope. We spent a good three hours around the tree before heading even farther uphill exploring for other tagged trees. We eventually found six. 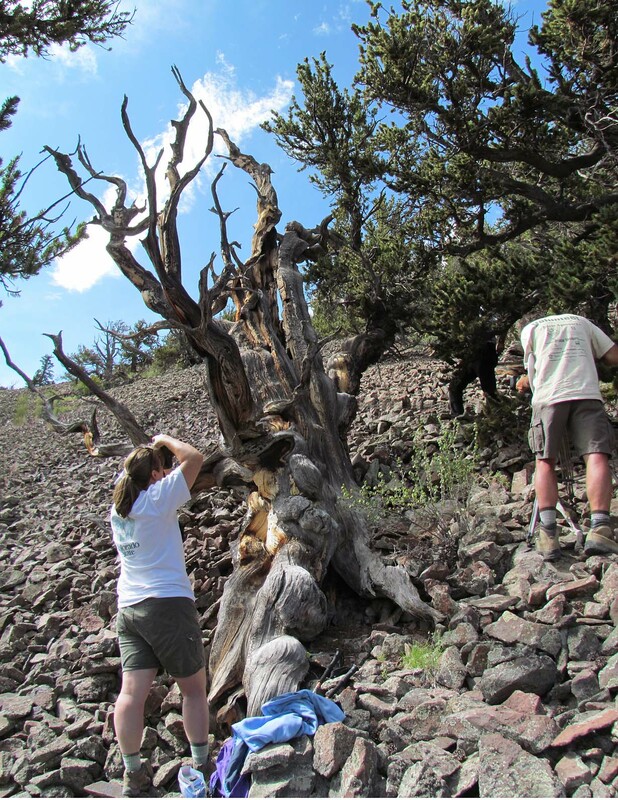 The trees were tagged and their age discovered by an amateur researcher who had a lifelong interest in the oldest bristlecones. He finally was able to borrow a coring tool and learned the technique to use it, and then spent hours piecing together on a microscope the series of rings from multiple corings. He had to take multiple cores from each tree because the centuries had broken the trees down and often rotting out the heartwood. 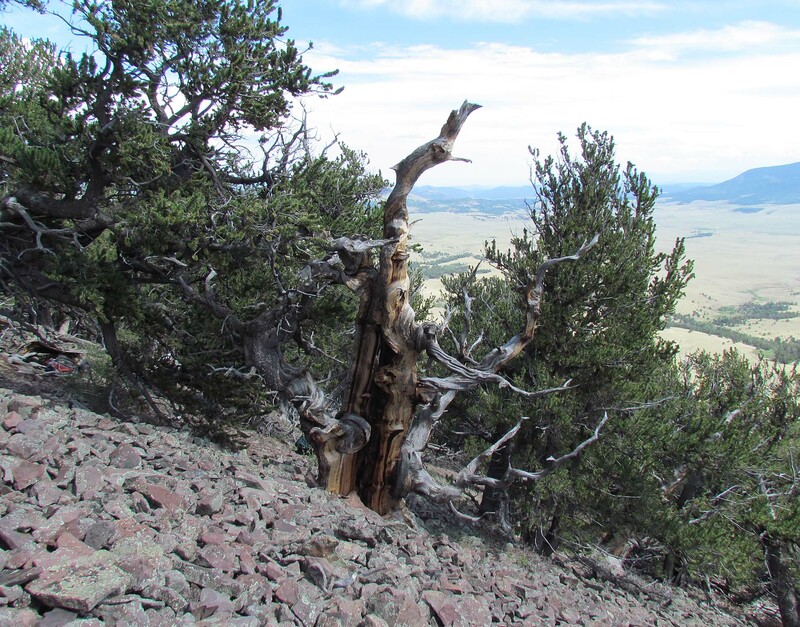 We were able to find two of the bore holes on this oldest tree. 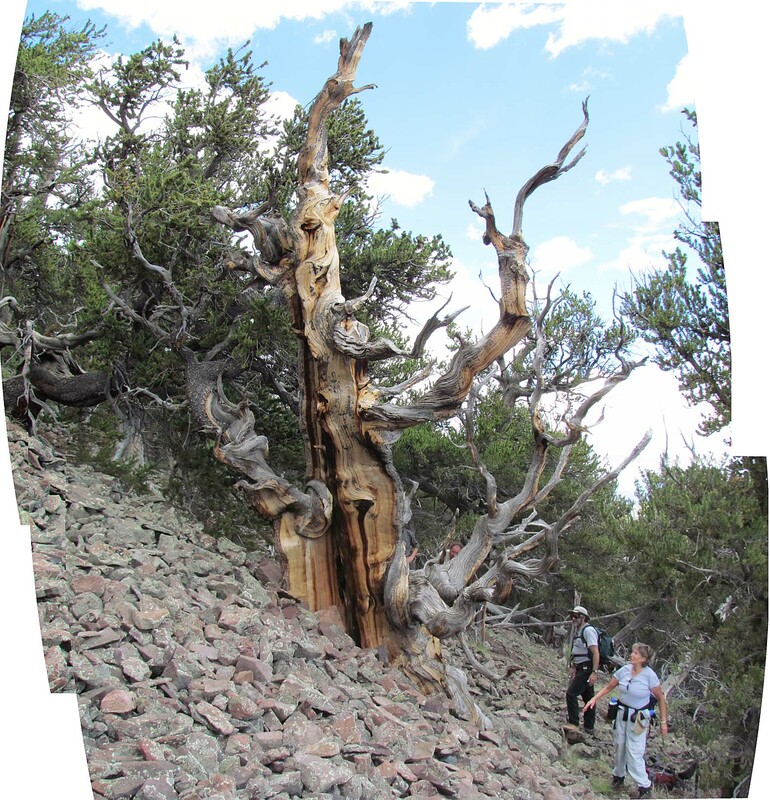 He determined that this one was about 2480 years old (taking into account missing rings from the heartwood and the time it took to grow to the height of the core) when he sampled it sometime in 1989-1991. That researcher has since died and many of his research notes are now missing - especially the key that correlates the tag numbers with his findings. Yes, the tree still lives. It still produces cones with seeds. It is quite likely that the trees around it are its descendents. We gathered some seeds still in the cones on the ground, but have since found out that they are not viable. 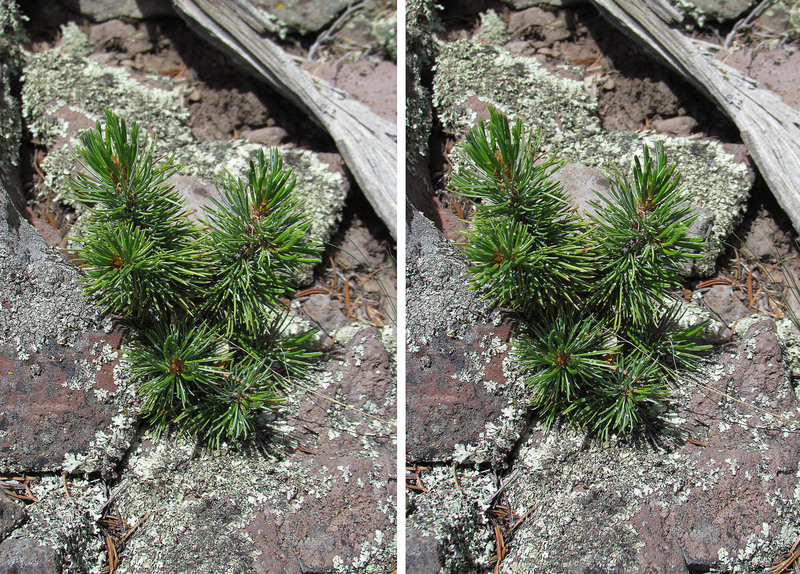 Bristlecones open to scatter their seeds in the fall. Those seeds must sprout in the spring. But even after six months of growing, they are not hardy enough to survive in 15 degree F. It appears what they need is an early spring, a very mild and long fall and a mild winter. As a consequence, very very few seeds ever sprout. Hence the benefit of longevity. The trees have to wait till the weather cycle produces mild years. And so it stands and waits. For what, it knows not. 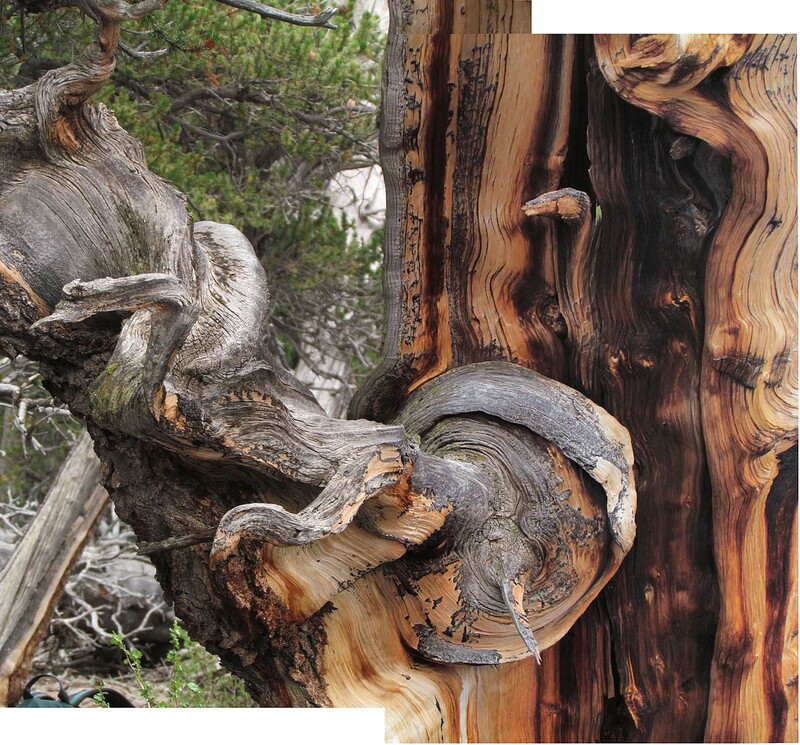 This set of photos was taken at different points around the oldest tree. It shows just how different it can look depending on the angle. 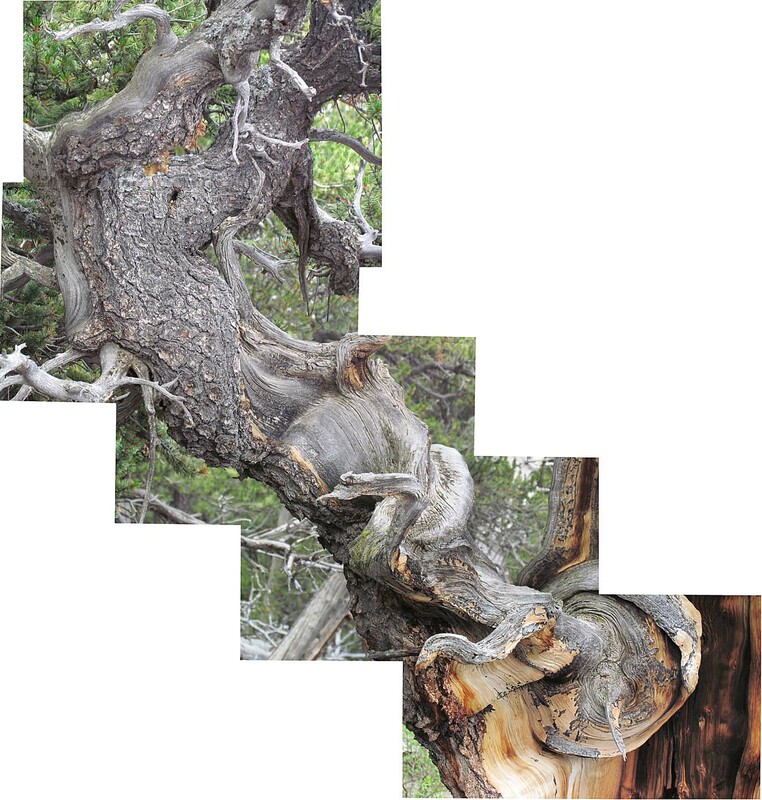 The first three photos show the still-living branch. It shows just how unusually swirled and swollen it becomes - very sculptural. 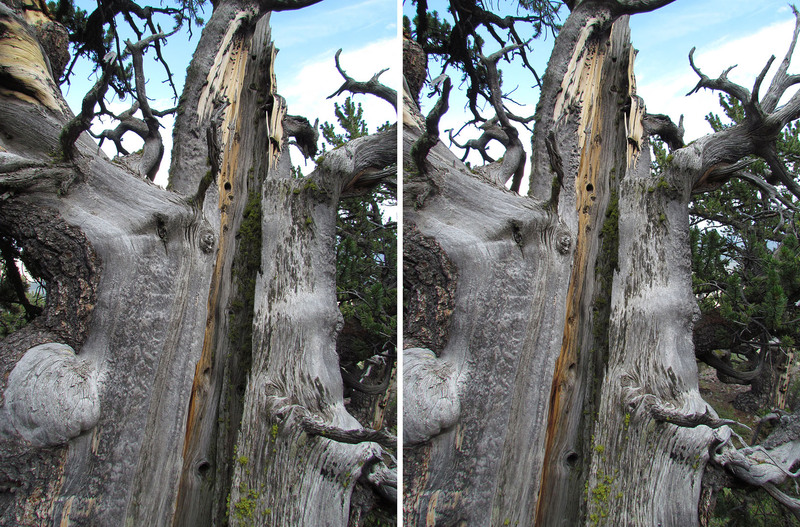 The 4th photo shows the colors of the exposed main trunk, now dead. 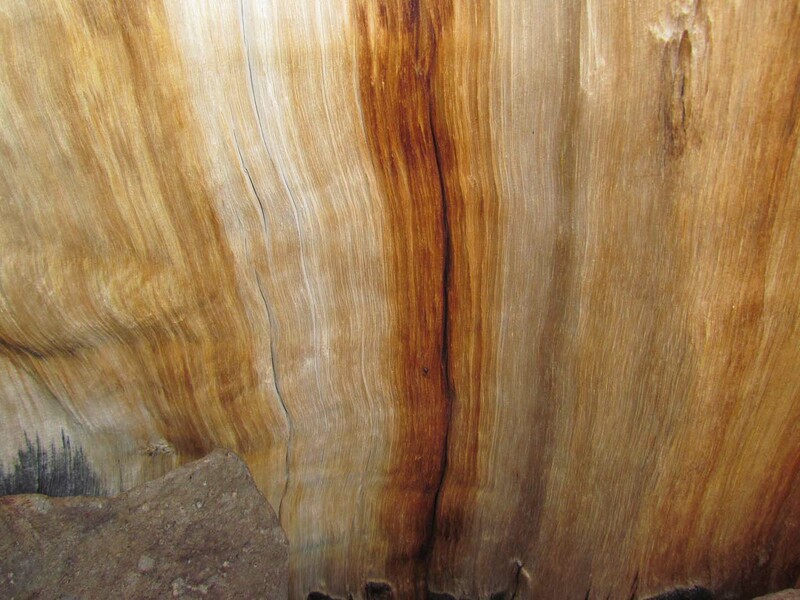 The darker band is the oldest part - the heartwood, which is beginning to disintegrate. The 5th photo shows one of the bore holes, 20 years now after it was made. 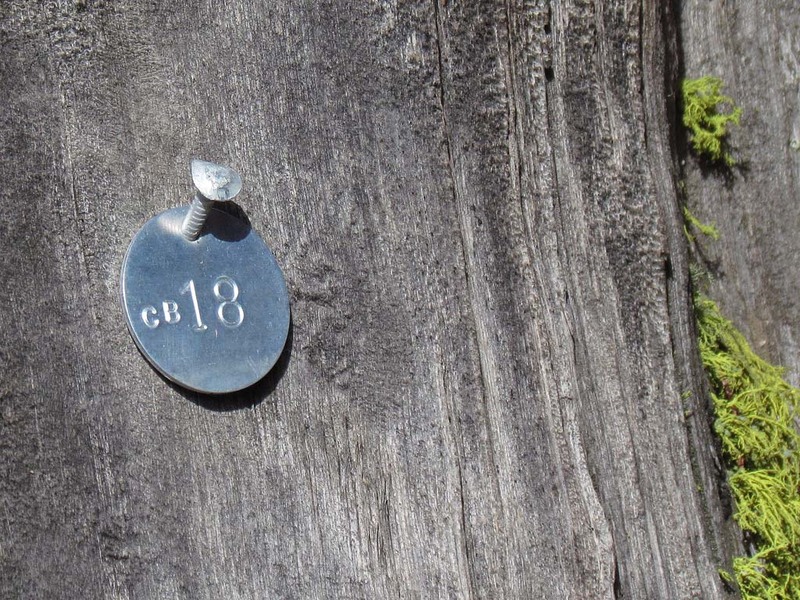 The 6th photo shows the identifying tag left by the researcher. It is about one inch in diameter. The 7th photo shows one of this tree's pincones. 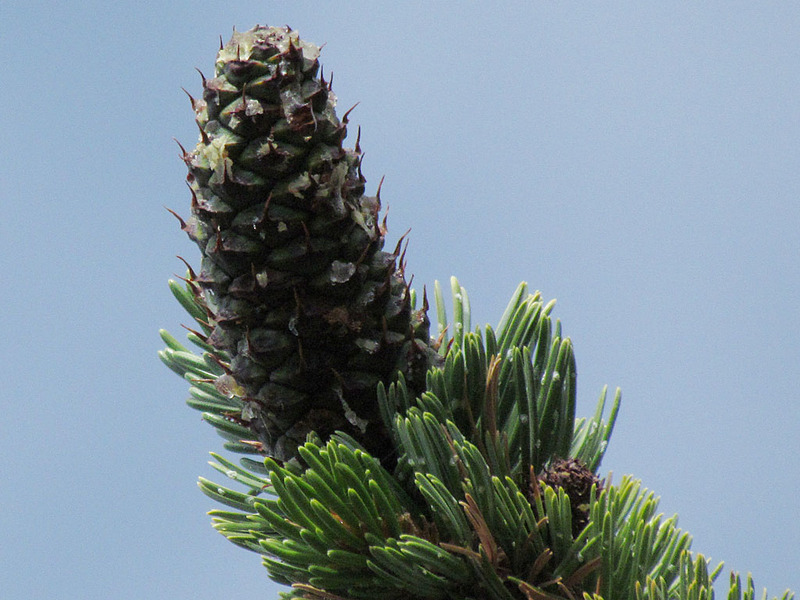 Note the "bristles" that extend from the cone - the basis of these trees' name. 2nd pair: looking up along the living branch. The exposed part of the branch is no longer living - only the part still covered with bark. 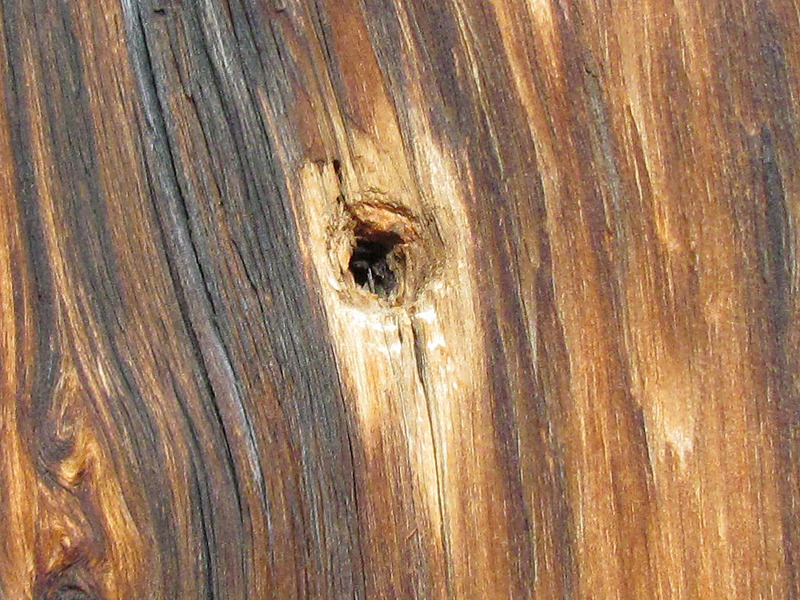 3rd pair: the main trunk showing the rotting heartwood. 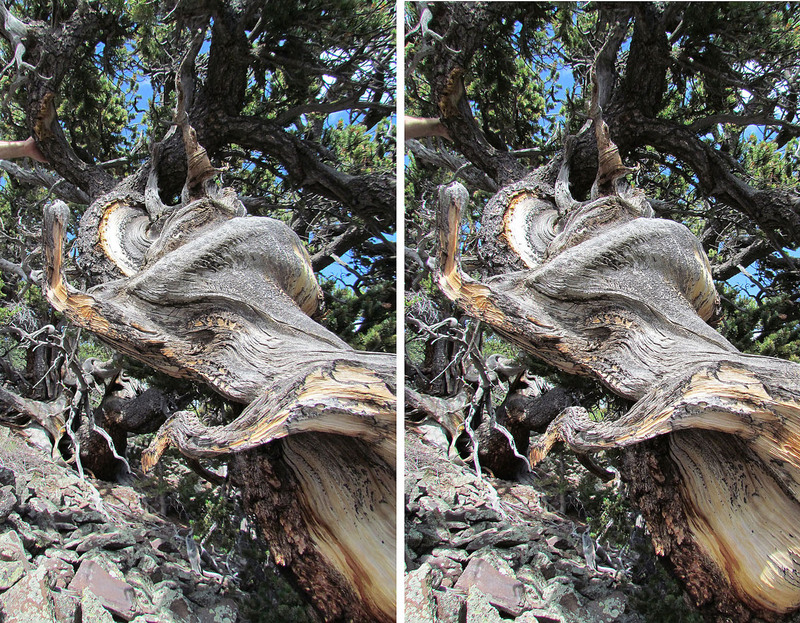 4th pair: some wind blasted trunk at the base. 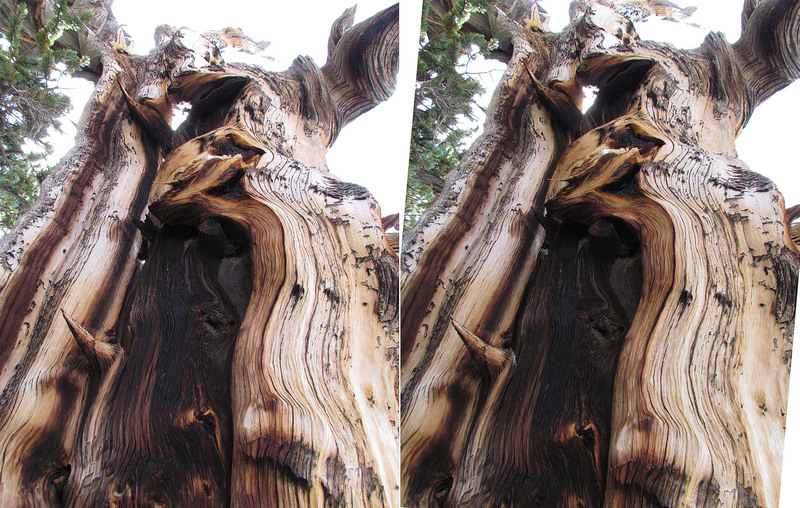 1st photo & 1st pair: possibly the 2nd oldest tree. We were unsure based on the trunk width measurement. Obviously that can vary depending on where it is taken. 2nd and 3rd pair: the 4th oldest tree. You can get an idea of how small it is by the person's head behind it in the 1st stereo pair. 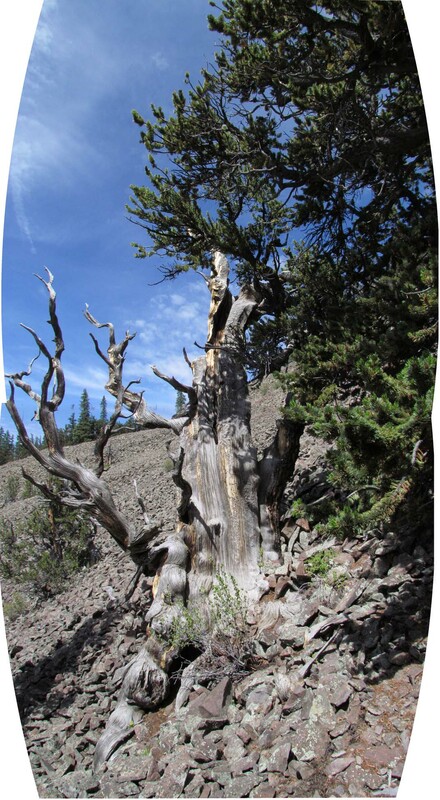 4th pair: a future oldest living tree. This is how they begin. It is about 6 inches tall.